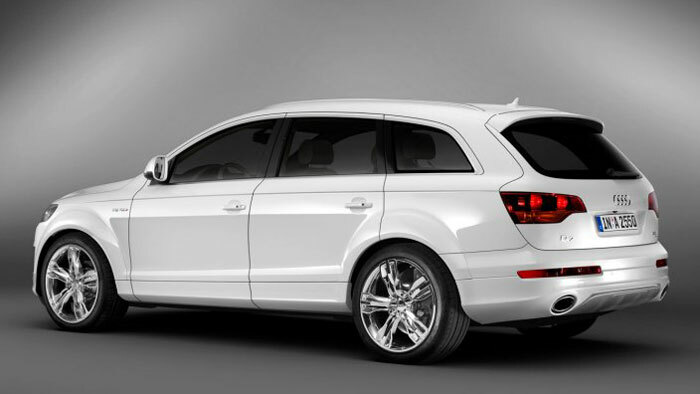 The Audi Q7 is a proper luxury seven seater SUV. 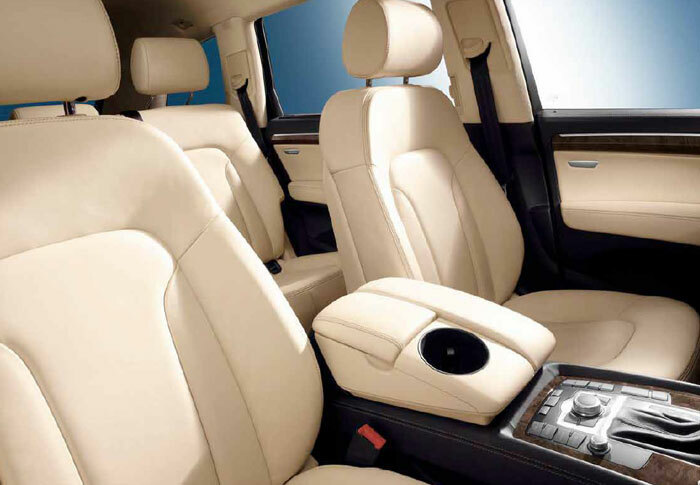 If you have looked at the BMW X5 but been put off by the lack of space afforded to the third row seats you will need have no worries with the Q7. Passengers travelling in the boot seats get almost as much space as any others. As you would expect from Audi you will have a choice of powerful engines that are able to provide you with ample performance. There are two sides to the Q7. If you are looking for passenger space then you have it in spoon fulls with this car. All three rows have more than enough legroom which is something that often cannot be said for the competition. And not only that but even when you are using all seven seats you still have 330 litres of boot space available. Fold all the seats flat and you have a massive 2,035 litres of useable space and in five seat configuration you have 775 boot space to play with. The other side to all this space is the sheer size of the Q7 when driving around town and the problem of finding suitable parking spaces. Strangely the Q7 only achieved four stars in the Euro NCAP test which was performed in 2006. According to Euro NCAP: “poor welding resulted in rupture of the footwell area”. Since that test Audi have corrected the issue and the Q7 gained the full 5 stars in the similar United States test performed by the NHTSA. One thing that the Audi does that very few other manufacturers do is to provide the same levels of safety for the third row passengers as all other passengers in the car. I’m talking here about airbags and the Q7 has side curtain airbags that extend all the way from the front to the boot. As you would expect with a car of this quality it comes with a lot of active safety features from the Electronic Stability Programme (ESP) to Audi’s traction control system (ASR). With the size of this car and the cost of fuel it is not surprising that in the UK Audi offer the Q7 with a choice of three diesel engines. Two 3.0 litre versions with different power outputs and a 4.2 TDi. Although the SE trim is only offered with the lowest powered 3.0 TDI. 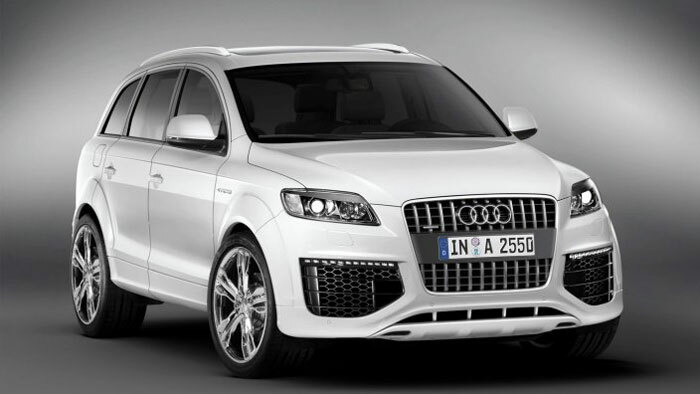 All Audi Q7 models come with an eight speed tiptronic automatic gearbox. Despite the bulk of this car all engines provide good power from the base 3.0 TDI which propels the Q7 to 62 miles per hour in 9.1 seconds to the 4.2 TDI which has almost sports car performance with a 0-62mph time of just 6.4 seconds and a top speed of 150 miles per hour. Stylish, modern, luxurious. These are just three adjectives that could be used to describe the interior of the Q7. It follows the similar styling to the rest of the Audi range and provides the driver with well positioned controls and great visibility from a high up driving position. It is not an agile car and doesn’t handle as well as the BMW X5 but is certainly meant more for roads than off road where it moves briskly taking on most road surfaces whilst still providing a comfortable ride. Like Mercedes, Audi supply Alcantara “leather” as standard on the Q7. Whilst this man-made material has many similar properties to real leather some owners say that it doesn’t have the same durability and is not as easily wiped clean. There is also a wide choice of leather available in many different colours and combinations. In fact the whole cabin can be customized with different inlays to create your unique environment. Audi are renowned for their build quality and there shouldn’t be too many problems with the Q7 though some owners have reported some issues on the earlier models that are frankly disappointing for a car of this class. Audi say that on the Q7 they recycle the energy used by braking to provide electrical power to charge the battery helping to save fuel by 3%. 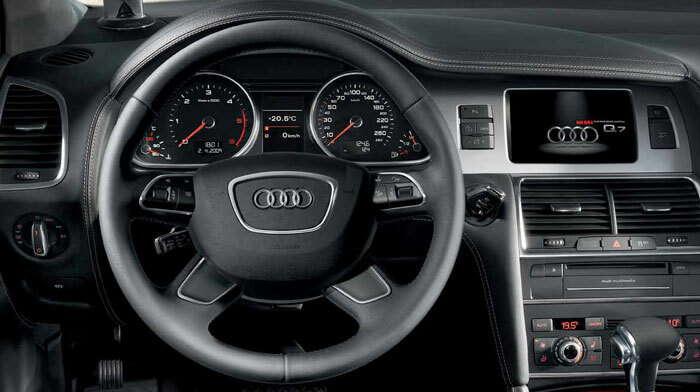 On the 3.0 TDI there is stop / start technology to help conserve fuel. Despite the fact that this is a very large SUV and can never be considered cheap to run the fuel economy of the engines is quite respectable with a combined miles per gallon ranging from 39.2 mpg to 30.7 mpg on the 4.2 TDI Quattro. CO2 emissions are also not too bad for such a large car at 189 for the 3.0 TDI which puts it in band J for Vehicle Excise Duty. Clearly Audi have done a good job to reduce the running costs of the Q7 but then again a car of this size can never compare with a supermini. 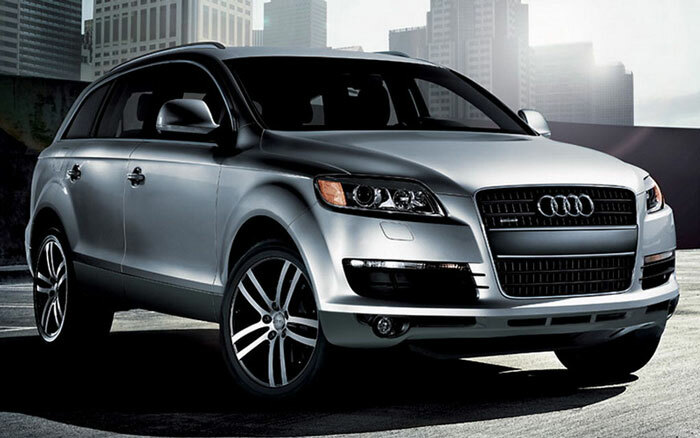 If you are looking for a large luxury SUV the Audi Q7 must be considered. Not as good as the Land Rover Discovery off road and not as good as the BMX X5 on the road it nevertheless is competitively priced, with great performance.